Thomas Barr Johnston was born on 19 July 1921 in Bellshill, Lanarkshire, the youngest of the three children of Peter and Elizabeth Johnston. His father was a music teacher at Bellshill Academy, and the young Tommy went to school there. After leaving school he went to work in the laboratory of the local steelworks. Like many young men of his generation, Johnston wanted to fly, and he volunteered for the RAF when the war broke out. He was sent to Canada to train, returning in 1942. He was posted to 207 Squadron in July 1942, and flew on his first operation on 21 July as bomb aimer with Flt Sgt V Duxbury, on a trip to Duisberg. He took part in three more operations with different pilots in September, and was then posted to a Conversion Unit. It would seem that he met up with Bill Ottley, Ron Marsden, Jack Guterman and Fred Tees there, as they were all posted together to 207 Squadron from 1660 Conversion Unit on 12 November 1942. Their future crewmates Harry Strange and Jack Barrett were also posted from the same conversion unit to 207 Squadron within a few days. 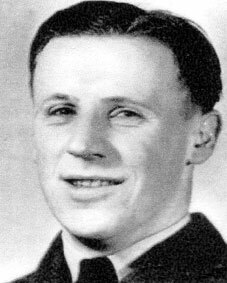 Tommy Johnston was established as Ottley’s regular bomb aimer by the middle of March 1943, and is unlikely to have hesitated when offered a posting to the new 617 Squadron. There was recipe for further confusion in the new squadron, when it emerged that there already two bomb aimers with the surname Johnson. Sadly, this soon ceased to be a problem for the young Scot as the crew did not complete their first operation, the Dams Raid. Six of them died when they were shot down near Hamm on 17 May 1943. Tommy Johnston and his comrades were originally buried in by the Germans in Hamm, but were reinterred after the war in Reichswald Forest War Cemetery. Thanks to Bill Gracie for help with this article.